The aim of the game is to stack all the same suit playing cards in increasing order on each proper place on the play table. 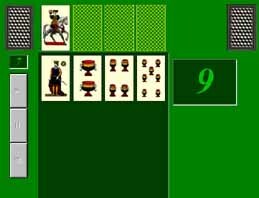 Contrariwise to most solitaires, the starting card to stack is not at all the ace, but any card random sorted in each game. When you rich the king, you start from ace. At the same time, in the decreasing columns, when you rich the ace you start from king.